Wataru Endo started his career for Shonan Bellmare who are based in Hiratsuka, Kanagawa Prefecture. Endo made 158 appearances for Shonan Bellmare scoring 23 times, which are brilliant stats for a defensive player. That kind of form must have caught the attention of Urawa Red Diamonds who are one of the bigger clubs in the J-League and he transferred to the Saitama based club for the 2016 season. Going on to complete 62 appearances and scoring 3 goals. Sint-Truiden splashed out €1.45 million on Endo and he has already started to repay that outlay within 3 minutes of stepping off the bench. Endo’s good form in the J-League saw him called up to the Japanese squad for the World Cup, but he didn’t manage to get any playing time. 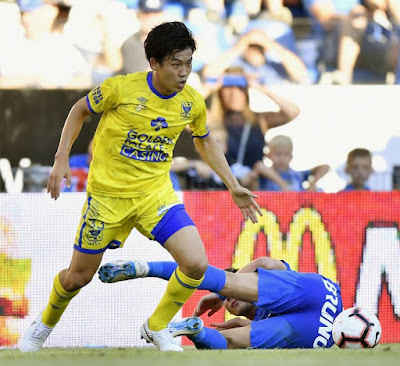 Nevertheless, Japan’s exceptional performance which was above everyone’s expectations has seemingly helped with a few Japanese players making transfers to Europe this summer. Although it is hard to tell if it is more than the usual amount the World Cup performances can only have helped make European clubs aware of how technically good Japanese football and players are. Endo had to sit on the bench and be patient before making his debut in Belgium for Sint-Truiden. Sint-Truiden. Introduced into the second game of the season against cult Belgian club Genk on 69 minutes and 3 minutes later he made an immediate impact. Collecting a ball from teammate Yohan Boli, Endo hit a first time shot from the edge of the area that flew past Genk keeper Danny Vukovic. This performance will see Endo push hard for a starting place in the next game, and no doubt more and a more European clubs will look to the Asian market for transfer value as prices in Europe continue to spiral out of control.